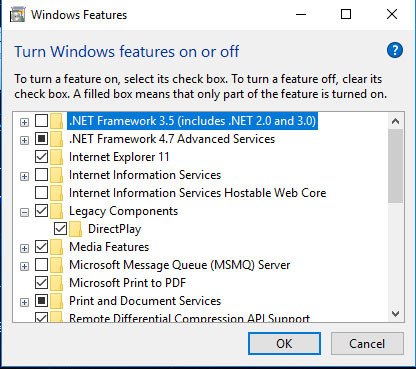 3. add option to "continue anyway" when components are already installed. 6. change text in installer on final install page, "Finishing installation...." to "NOTICE: Compressing Files to stbof.res, this may take 1-3 minutes per mod selected." 9. update all the patches for QD's patcher, add missing descriptions, change links to https://, add new patches for more mods. Please read complete post before installing! Before game will run you must have Directplay installed. Note: installer should enable Directplay for you when using version 1.0.1. You can install directplay though control panel. 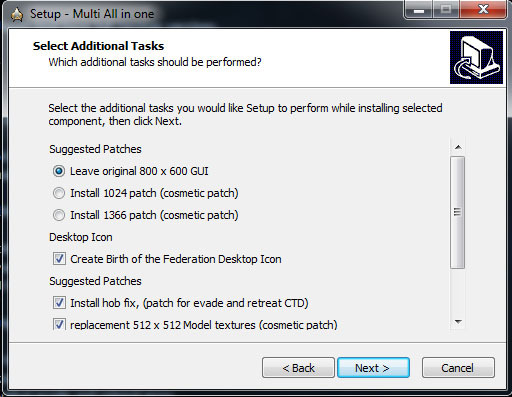 Select "Programs and Features" on left select "Turn windows Features on or off"
expand "legacy components" and select "Directplay"
QD's Patcher (with option to select different patch folder) included folders; QD's patch folder, BOP_patches, um5_patches, ecm4.0_patches, ucw_patches and udm_patches. What to expect when running new installer. 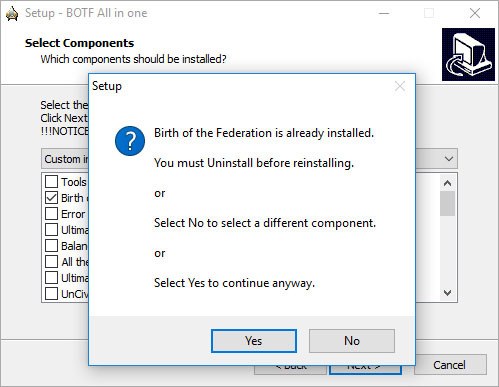 When you first execute BOTF_All_in_One_1.0.1.exe you will be prompted to select the language to install. 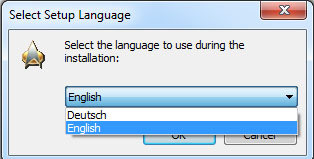 Note; since most mods were released in English only, When German is selected, the installer will install as much German as possible. Some mods this is very limited. example; with Ultimate Dominion mod, when Dominion or Federation is played it would be still mostly English, while Cardassins, Klingons and Romulans would be only 30% English. Vanilla, Error correction mod, Balance of power and Planet mod have full German versions. you must accept before continuing. Next, you will need to select the "Base folder location used by installer"
If you want to change this location you will need to change location each time installer is executed. Next, you need to select what you want to install on this execution of the installer from the list. 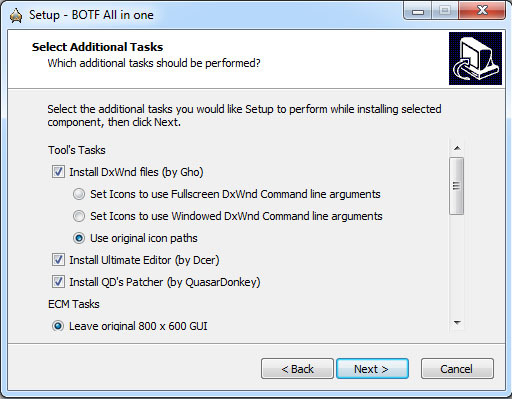 If you plan on using DxWnd you need to install the tools on first execution so each mod can adjust install path used by DxWnd. When a mod is already installed it should be uninstalled before re-installing or you will get this message. If you "continue anyway" all old files will be overwritten with new files. Setting Command line arguments for shortcuts. Note; This setting section effects the paths all shortcut use. Next, you can select options for the selected mod being installed. if mods have larger galaxies you can select to install zoomed in view. option to add desktop icon. 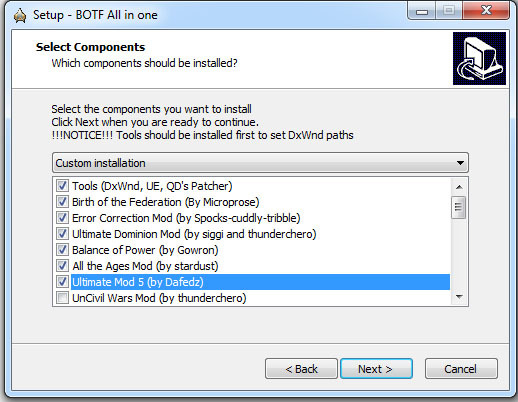 some mods will also have option to add hob fix for combat evade and retreat CTD. vanilla also has same special options as latest version. each installation has a folder added to the start menu for "Documentations" this will have various file such as original readme files and links to support pages. This patch has had limited testing, but I have had no issues when applied to 800 x 600 versions. This patch has been updated. right click selection and select 'modify" from dropdown menu. Just add command you want to "Launch" line then click "OK"
close DxWnd window and when asked save task list changes. any time after that, the edited version (mod) will start using command prompt. sorry you are having this issue. it sounds like uninstall issue or files were removed/deleted manually. if everything is uninstalled as you say, You need to remove some left over registries. open "regedit.exe" in C:\windows folder. 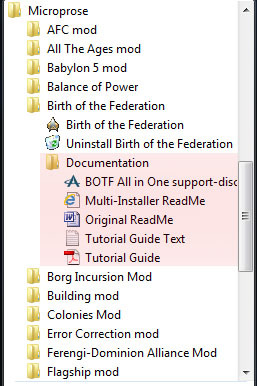 select the "microprose" folder on left and right click, from menu select delete and confirm deletion. I thought I would also mention due to the size of installer, after first executing it may take 10 -20 sec before select language dialog opens. this is normal due to file size and your security that is running. Also after installer completes and you select finish button, The trek icon in task bar will remain until all temp files are deleted. example if you install everything and at 1366 it may take 2-3 min to delete all the temp files. any thought on new "DxWnd" shortcut paths? I added a "How to add mudd cheats to DxWnd"
Please let me know if you have any other questions or need me to explain anything further. Just wanted to say that I had this issue, and this post fixed it! However, I did have to run regedit as an admin to enable the folder to delete properly. Due to the popularity of this file we are experiencing download issues. if you get message "Error 503 Service Unavailable" please re-try later. At the moment the download is't working at all, is their a second download link somewhere? Sorry some members are having this issue. all I can say is try again later. or try different browser. all I can think is it is an overload issue with host, but every time I contact host they say there is no issues. also since you are a new member, how did you here about this file?